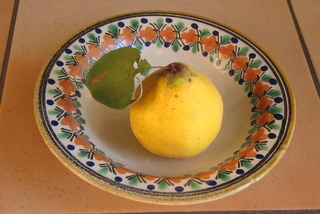 If you’ve not yet met a quince, you’ve a treat in store. These fragrant, downy, golden globes, distant relatives of the apple family, are not so much forbidden fruits as forgotten fruits. Mine are ripening now on the tree and I’m also beginning to sight some in the shops and markets here in Alsace and over the border in Switzerland (in French they’re coings, in German Quitten). If you should happen upon some of these fragrant fruits, swoop on them and set them on a beautiful plate in the kitchen while you consider what to do with them. As you deliberate, the air will be filled with their delicate, faintly lemony scent, likened by the 10th-century Arab-Andalusian poet Shafer ben Utman al-Mushafi to the perfume of a loved woman. One idea is to peel and core them and bake them whole in the oven, bathed in a syrup of honey, sugar, lemon juice and water. Done this way, they turn magically from a brilliant daffodil yellow to a burnished coppery color. They’re disgracefully good served warm, with honey ice cream. 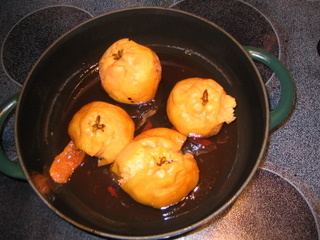 Or chop them up and turn them into chutney, mixed with oranges, raisins, white wine vinegar, sugar and loads of ginger. For an original apple tart, try substituting a quince for one of the apples, peel and grate all the fruit together, mix with cream, eggs and sugar and bake in a fragile pastry case. Best of all, turn them into a shimmering jelly, which makes a delightful gift. Pour into pretty pots, cut fabric hats for the tops and label the jars with pride. Append a little note to each jar explaining to the lucky recipient that quince jelly is magic on toast, or melted and brushed over an apple tart to give a glossy, totally professional French pastry shop finish. 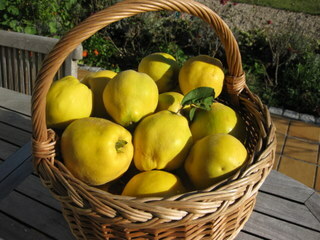 Hi Sue I received a whole grocery of quinces but they are green not yellow. What should I do with them? Do they ripen off the tree or was my benefactor too quick to pick? Hi Wendy – what a lovely gift! 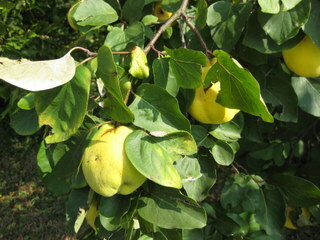 If still green they’re not yet ripe (as are the ones on my own tree at the moment), but my hunch is they will still ripen even off the tree (just had a look online and it seems this is true http://www.doityourself.com/stry/how-to-harvest-a-quince#.UkRbIn-jb-Y). Put them in a cool dark place, best of all wrapped in newspaper and in any case well separated from one another and leave them for a few weeks, checking every now and then to see how they’re coming along. Let me know, please! Thanks Sue ….. in the cellar and ripening as we speak. Will then try and make marmalade which my kids love and which is a tradition in my husband’s family. If it works will bring you a jar!!!! I can already imagine the perfume as they ripen in the cellar 🙂 . Looking forward to tasting the fruits!